Evening! Just a quick one, I popped into town today to pick up a diary, I desperately needed one. My memory is shocking and with lots of Plus North business coming up along with general day to day appointments, I need to write things down, and although I've got my phone there's nothing quite like writing it in a diary is there? I was in BHS looking for said diary when I accidentally fell into the Dorothy Perkins concession....ahem... I couldn't resist these cute little bits in the sale, at £3 each it just fell in love, and hey, at least it wasn't a full on clothes splurge! Ha! The earring set is great. Now that my hair is super short I feel a bit naked without earrings in and this way I can have a bit of variety. 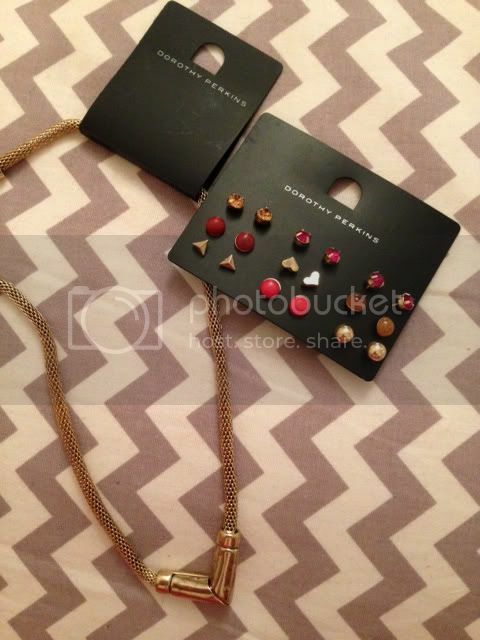 I especially love the hearts and the pointed studs! Have you picked up any bargains form the sales? I could go mad, but sadly funds won't allow! Cute earrings. When I had short hair, I was the same, I had to have my earrings in. I caved and bought the Clements Ribeiro pansy print dress from Evans and a few things from TK Maxx. Love those earrings! What a great sales find! I'm a lot into stud earrings myself lately, never liked them much before. Funny how one's taste changes over time, huh?